In the halls of today's schools, children are likely to encounter a multitude of students different from themselves, whether in the color of their skin, their clothing, or their personal or religious beliefs. In the adolescent years especially, certain rites marking the passage from childhood to adulthood mean that you and your kids are likely to be invited to an array of multicultural celebrations. Use your resources. Whether it's checking out a library book on religious differences, or extending a dinner invitation to a co-worker who celebrates Passover instead of Easter, introduce your child to differences early by bringing it into the home. Visit a house of worship different from your own, and talk about the similarities and differences you see. Fowler also suggests “looking at other expressions of holidays, and what are the similarities” with those already familiar to you. First Communion: Between the ages of 7- 8, Catholic children take communion for the first time. If you’re invited to a first communion, you’ll probably see little girls dressed in white dresses with white veils and gloves, and boys dressed formally. The ceremony may be followed by a party. Some people will give religious gifts like rosaries and prayer books. Since there will probably be lots of photography, a picture frame makes an appropriate secular gift. Bar or Bat Mitzvah: At age 12 for girls and 13 for boys, Jewish kids reach the age of moral responsibility. They’re considered mature enough to take responsibility for their actions and to play an active role in religious life. Although this happens automatically, it’s common for families to celebrate with a special religious service and party. 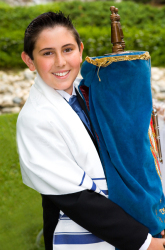 The bar (male) or bat (female) mitzvah child will probably do a reading from the Torah at the Shabbat service on Saturday morning. The ceremony will be followed with a party that could be casual and kids-only or formal, including all ages. Any type of gift is appropriate. Money and gift certificates are often given in $18 increments, since 18 if the numerical equivalent of the word “life” in Hebrew. Confirmation: Christian churches offer confirmation at different ages. In the Anglican or Episcopal Church, children are confirmed in early adolescence, often between 14–16; in the Methodist church, it happens in junior high. The ceremony marks the child’s acceptance of Christian doctrine and may cap years of study in Sunday school. It may or may not be celebrated with a party. Quinceanera: This Latin American tradition is a cross between the American “sweet sixteen” and a debutante ball. At age 15, girls become young adults and celebrate with a huge party that can be as elaborate as a wedding. In Catholic families, there will be a special mass in the morning. At the party afterwards, the birthday girl wears a white gown and holds court with 14 friends. The traditions vary according to background, but often include the girl changing from flats into high heels (to demonstrate her transition to womanhood) and dancing a waltz with her father. The quinceanera’s family will probably give her religious and symbolic gifts, but anything is appropriate. Next Article: Why Teach History?